Residents of Makati or Employees working in Makati would be happy to know that the newly opened Vikings in Jazz Mall Makati is offering a 20% discount for cash or credit card payments. 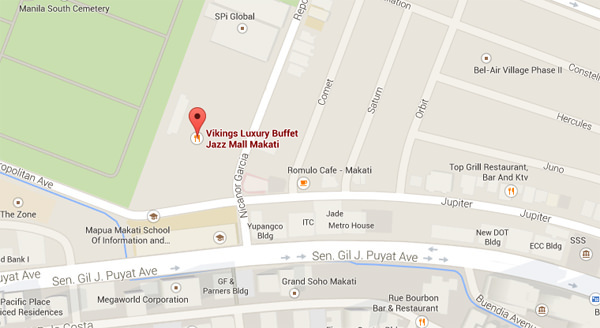 Employees or residents in the Makati City will receive a 20% discount, cash or card, upon dining at Vikings Jazz Mall. For employees in the Makati City, he/she must present a corporate ID with their address on it. In case the office address is not on the I.D., he/she may supplement their corporate ID with a corporate calling card or a government issued I.D. For residents in the Makati City, he/she must present a valid and original government issued I.D. This discount is valid from December 27, 2014 – January 5, 2015. This discount is available only in Vikings Jazz Mall Makati. To commute there, just ride any jeep that passes by the Buendia route and get off the stop light near Mapua Makati. Then walk to Jazz Mall. For reservations, call 0917-827-1888, 0919-999-7888. You may also send them a private message on their Facebook page. Header image taken from Vikings Jazz Mall Facebook page.